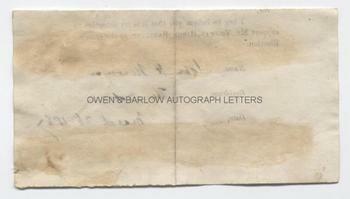 CARDINAL JOHN HENRY NEWMAN autograph Signature on voting form. British (English) cleric, philosopher, poet, writer and founder of the Oxford Movement. Beatified by Pope Benedict XVI in 2010. 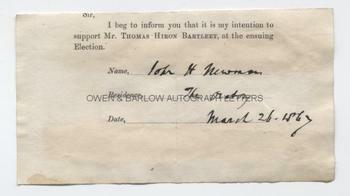 Autograph signature with address "the Oratory" and date "March 26th 1867" in his hand below the printed words "Sir, I beg to inform you that it is my intention to support Mr Thomas Hiron Bartleet, at the ensuing election." Approx 5 x 2.75 inches. Trimmed at top edge and with mounting traces to verso. All else very good. Cardinal Newman was a convert from Anglicanism and arguably the most influential and important figure in 19th century British religious history. In addition to his considerable achievements in THEOLOGY, he was also an accomplished writer and poet and was the author of The Dream of Gerontius and other works. Thomas Hiron Bartleet (1837-1891) was a surgeon. He was elected as Surgeon to the General Hospital in 1867 after a contest that cost him over £800. This notice of intended voting at the ballot was evidently part of this campaign, in which Cardinal Newman appears to have had an interest, possibly as one of the trustees of the hospital.